Fast and accurated (FAME) Motorola 68000 core by Fox68k. Dreamcast SD-Card support for savestates and disk changes. Supports MSA & ST disks images. Mouse & Keyboard Dreamcast supported. Virtual Keyboard with triggers L-R.
X button Map a ST-key using X button under Virtual Keyboard. 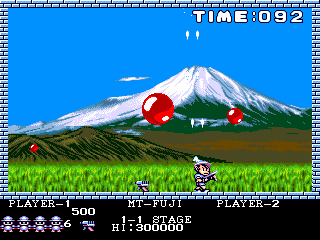 Joystick is emulated with digital pad + A,X buttons. Mouse is emulated with analog pad + Y,B buttons. SH4 exceptions catched for stability. Superthrottle mode for speed up intros and loading time. Save disks changes to VMU. Atari ST video 50/60Hz switch support. Close to 100 % compatibility. TV filter using OpenGL (not for Dreamcast). 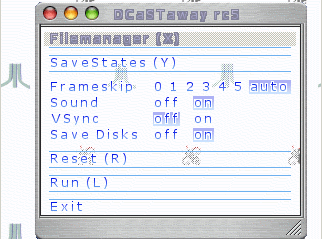 DCaSTaway can save to VMU disk sectors changed using ZIP compression. For games as SimCity, now you can save your new cities and continue at future. A new menu option called "Save Disks" has added for enable or disable this feature. Hold right trigger first and left trigger second for automatic sound off and frameskip to 10 for speed up. This try to avoid large time for intros and loading time. You can choose on filemanager a new disk for floppy A with A button and a new disk for floppy B with Y button. A SubMenu called "SAVESTATE", in where you can find 4 slots to Save and Load from memory, if you reset the emulator that savestates are losted. Even using compressioin you will need a memory card with more than 1 MBit, compressed using Zip-9 takes a lot of memory at the moment. The CRC calculation can take a while during the loading. To solve this delay, the best you can do is to create a file from GNU/Linux, Windows and MACOS/X with the 'mkcache' executable that its included into DCaStaway. You only need to copy the EXE file mkcache.exe to the folder or directory in where all your ATARI ST images are, .zip, .st and .msd. Running the EXE will generate a file called stcache.txt. If DCaSTaway file manager detects this stcache.txt file, will be interpreted and will not calculate the CRC included in that cache, reducing dramatically the files sample time. - What's TOS? Why i see 'cannot find rom image' message? TOS is Atari ST ROM BIOS. You need a TOS image file for running DCaSTaway, preferredly TOS 1.04UK, named 'ROM' (without extension) in the root directory of the disk. 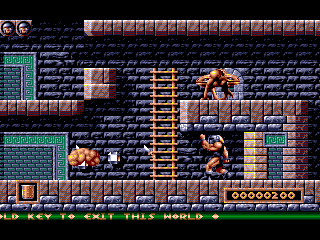 If you haven't a Atari ST for extracting ROM BIOS, you can use a free TOS: EMUTOS. - Where put ST disk images? Where you want, DCaSTaway have a filemanager with subdirs navigate, but it's recommended put maximum 128 files per directory and use MKCache for speed up. - Why don't save state to VMU? 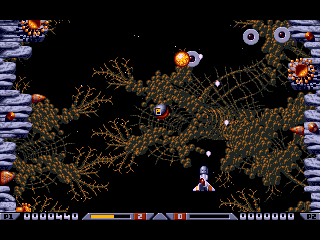 DCaSTaway have save state to VMU support, but VMU don't enough capacity for most of games. So, you can save state to memory. But after reset (ST or Dreamcast) you lost this states. - Where can find more info? Windows, GNU/Linux and MACOS/X are available, at the beginning only for testing MKCache and compatibity. - The TOS (named 'ROM') in same EXE directory. - ST disks wherever, does not matter. - F12 for main menu. - Joystick is emulated as cursor keys and Ctrl for fire button. You must include a TOS BIOS image file (named 'ROM' as the emulator expects this name without extension) in the root directory of the cdrom or /dcastaway/ of the SD-Card.